In Memory of Joel Smith Watkins, Jr.
Dr. Joel Smith Watkins, Jr., 83, of New Braunfels, Texas, passed away from complications of a stroke on Tuesday, February 23, 2016. Joel was born May 27, 1932 to Joel and Eva (Byers) Watkins in Poteau, Oklahoma, and grew up in Warren, Arkansas. In 1953, Joel was commissioned as an officer in the United States Marine Corps upon completion of the Naval Reserve Officers Training Corps program at the University of North Carolina at Chapel Hill, where he received a B.A. in Geology. After his medical retirement from the Marine Corps as a First Lieutenant, he attended the University of Texas at Austin, where he received his PhD in geophysics in 1961. 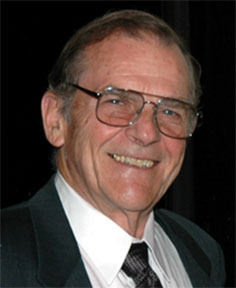 After completion of his doctorate, Joel worked as a geophysicist for the U.S. Geological Survey, the Massachusetts Institute of Technology, the University of North Carolina at Chapel Hill, the University of Texas at Austin, and Gulf Oil Corporation; ultimately retiring from Texas A&M University as a Professor Emeritus in 2002. For his work training astronauts and designing seismic instruments for Apollo 14, 16, and 17, he was awarded the NASA Medal for Exceptional Scientific Achievement and the USGS Outstanding Performance Award. He was the Vice President of Exploration Research for Gulf, and was the Earl F. Cook Professor, Departments of Oceanography and Geophysics, at Texas A&M University from 1986 to 2002. Joel was an active member of the New Braunfels Lions Club and a member of multiple professional societies in the areas of geology and geophysics. His work took him all over the world, and he loved to travel. Survivors include his two daughters, Catherine Barker of Pittsboro, NC and Victoria Pinkston of Aberdeen, NC; two sons-in-law, Bradley Barker and Robert Pinkston; one grandchild, Rebecca Watkins of Chapel Hill, NC; his brother Don and sister-in-law Carol Watkins of St. Louis, MO, his dear friend Lilly Santamaria and several nieces and nephews. Joel was a loving and beloved father, grandfather, brother, uncle, and friend. Online condolences can be left on Joel's obituary at the Lux Funeral Home website at luxfhcares.com/obituary. Memorial donations can be made to the Texas Lions Camp at www.lionscamp.com/Memorials.html.